The Art School Without Walls, Vol. 6 team votes on a name for their new mural. Teaching artists Billy Mode and Chris Stain prepare the group for the work ahead at their temporary headquarters at Industry City Studios. The Art School Without Walls, Vol. 6 has finally kicked into full gear. 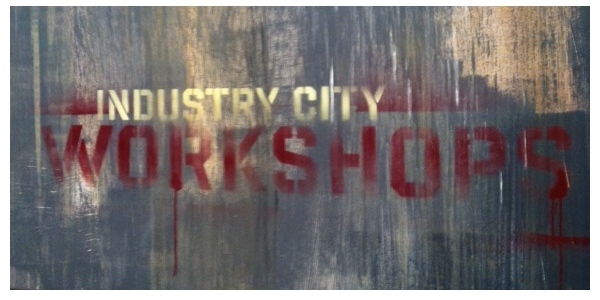 The team recently gathered at their large Industry City art studio, where the mural will be painted over the next few weeks before being relocated to its permanent home: a new residential building being developed by The Quinlan Development Group and Lonicera Partners at 267 Pacific Avenue in Boerum Hill, Brooklyn. The first orders of business were picking a name for the new mural and going over the logistics of its implementation. 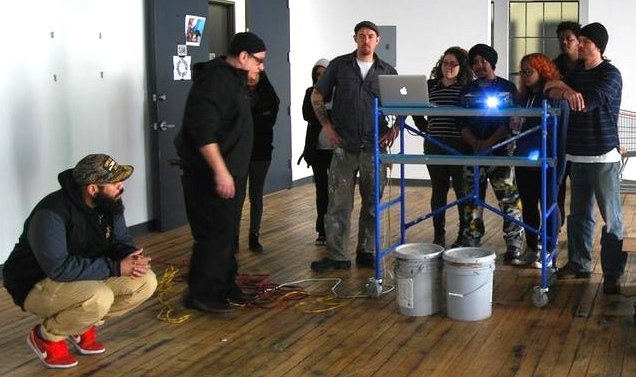 The apprentices also had time to become acquainted with teaching artist Billy Mode, who will be co-leading the project along with Chris Stain and Mista Oh. Chris Stain and Billy Mode with apprentices Moise Joseph and Evan Orion. 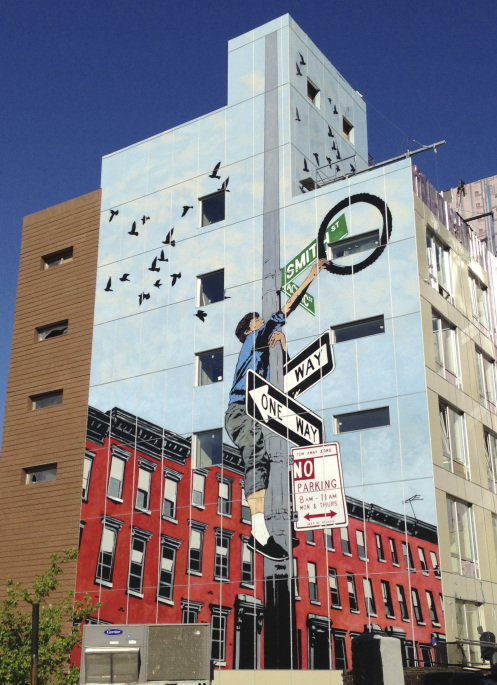 The mural is based on an iconic image from Martha Cooper‘s “Street Play Project,” her meditation on the resiliency of urban youth making the best of their circumstances to “make something out of nothing.” In the motivational spirit of her own work and Cre8tiveYouTH*ink’s mission, Cooper encouraged the young apprentices to choose possible names for the mural themselves. Robin Cembalest, the executive editor of ARTnews Magazine, lent her expertise by leading the team through brainstorming activities to come with ideas for the mural’s title. 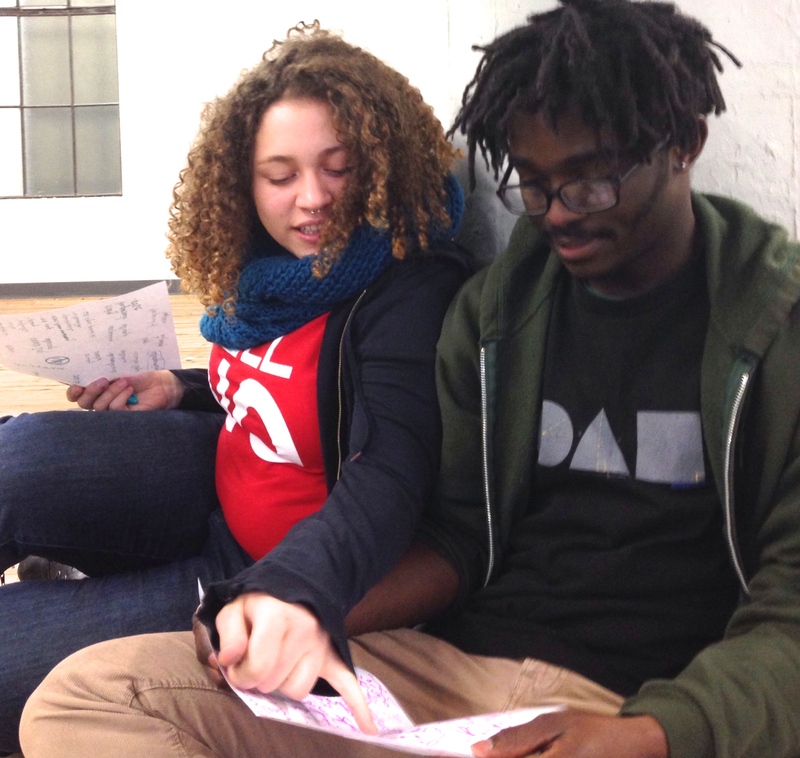 Apprentices Alicia Prieto and Andrew Humphrey discuss titles for the mural. After reflecting upon the content of the image and playing around with free associations, the team came up with ten choices which were later voted on by Martha Cooper herself, Chris Stain, Billy Mode and Mista Oh. “Sign Language” was ultimately chosen as the work’s title with “No One Way” coming in a close second. Billy Mode (left) and Chris Stain (right) break down the upcoming process for the apprentices. 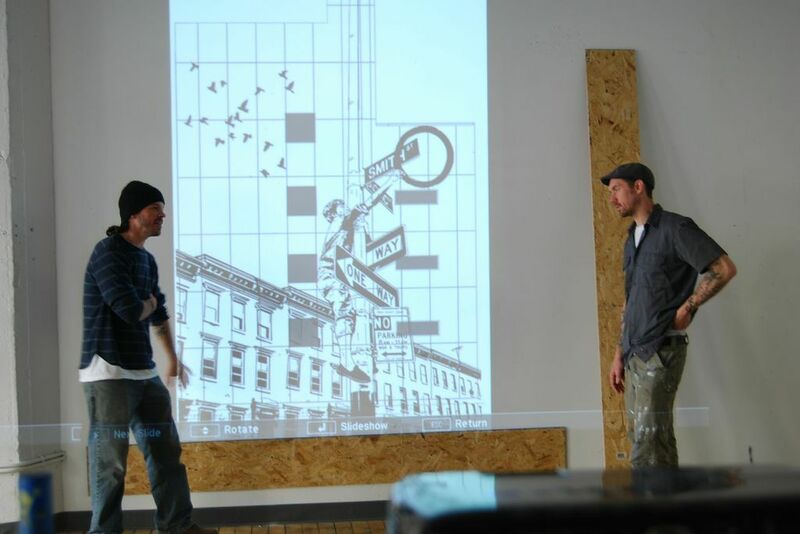 At the following meeting, Stain and Mode projected the image onto the wall and engaged the apprentices in a discussion of the process of the making of the mural. They explained how the approximately 100 4-foot-by-8-foot panels would be painted individually using a variety of techniques and materials. These include stencils, traditional exterior latex paints, aerosol spray paint and an industrial/marine clear overcoat for added protection. The group also discussed the use of the Photoshop program as an essential tool that was used to crop out each of the hundred sections — saving them digitally to enable projecting them onto each panel independently from the others. “The challenge is going to be adapting our precise measurements with the imprecise realities of the actual building itself, to be sure that all the panels line up correctly,” said Mista Oh. Chris Stain and Mista Oh discuss the project’s challenges with the Cre8tiveYouTH*ink team. In addition, since the group won’t be installing the panels themselves, they must follow the jig-saw puzzle-like coding system developed by the construction company handling the installation to ensure the panels are installed in their proper place. Billy Mode then shared details of his own life with the group. 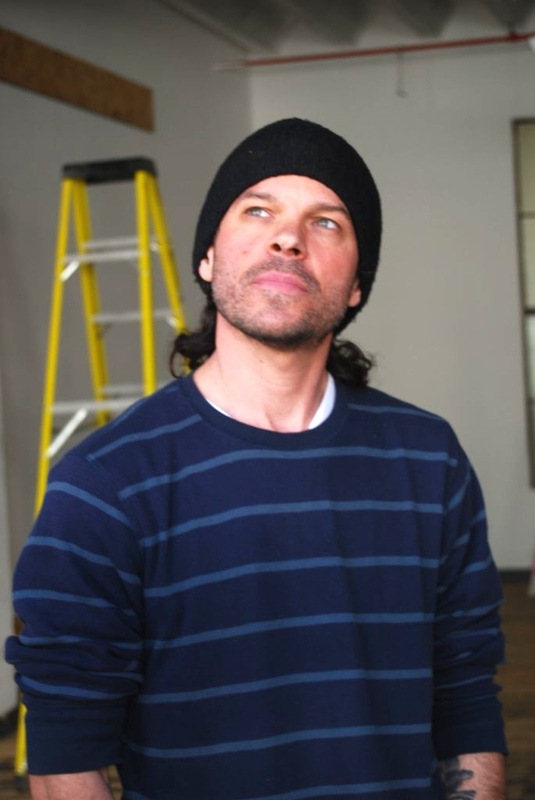 He credits the dynamic punk rock scene in Baltimore and Washington D.C. as an early influence on his work, citing bands like Bad Brains, in addition to the synergy that was emerging between the skateboarding, graffiti and hip-hop cultures. He described how he met Chris Stain as a teenager growing up in Baltimore in the 1980s, which Mode describes as, “the right place and the right time for street art.” “We remained friends through the ‘90s and began working on projects together because we pushed each other artistically,” said Mode about his early relationship with Stain. 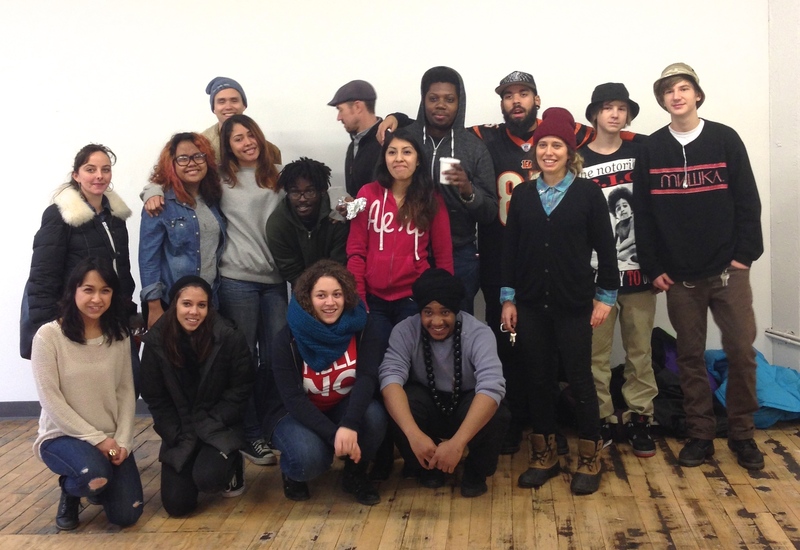 The Cre8tive YouTH*ink team at Industry City.